It’s always nice to see the unique ways people have for starting a campfire. 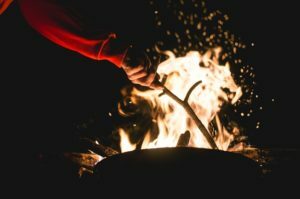 Campfires can vary quite a bit depending on the wood you use and how you lay the fuel to begin with. The man in the video below shows how to start two types of campfires; a Log Cabin Fire and a Self Feeding Fire. Both are interesting to watch and offer very different types of burn. It is interesting to see that one lights from above and the other lights from below. There is a big difference in how long each fire burns, however.